Self contained with views of rainforest & farmland. Stiruated in a private protected rainforest just 10 minutes drive from the Central North island town of Ohakune. Adventure begins on your doorstep as we're positioned right between the Tongariro National Park and the Whanganui National Park. 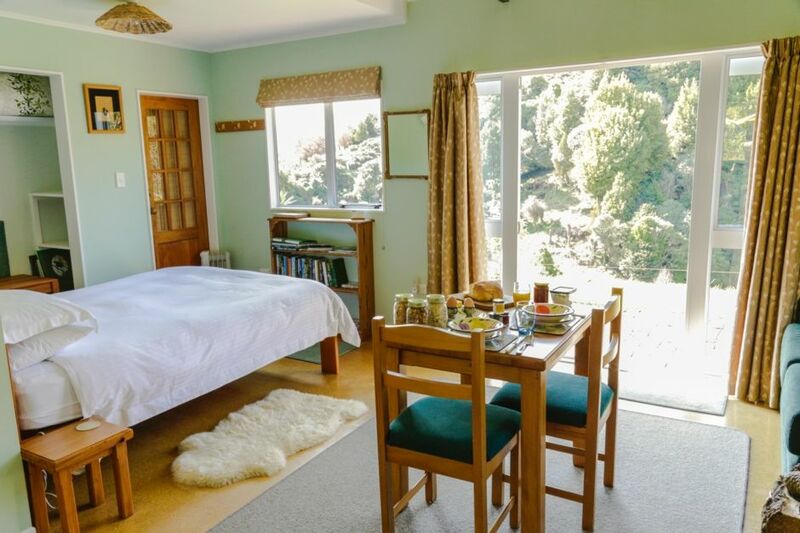 Whether you're here for the skiing on Mt Ruapehu, the Tongariro Crossing, the many cycleways, canoeing or just wanting some quiet time out, Berry's Bush Lodge, with it's proximity to all activities and it's private location offers it all. Fabulous breakfast of bread, homemade jams and fresh produce from the land. Apologies that the homemade bread, so often mentioned in our reviews will not always be available from August 2018. Quality supermarket replace it on the occasional day when we're not baking fresh. We have a new bathroom as of November 2017. The photos on this site haven't yet been updated, but expect better than is shown! Smoking is allowed on your private patio but please not inside the studio or in the bush around it. Hosting guests, ensuring their comfort & needs are met & making the stay a good one gives me enormous pleasure. My working career was spent working in hotels & restaurants in a number of countries around the globe, & the pleasure it gave me is still there. This private, protected rainforest that we are continuously hunting & trapping to keep predators under control is another great pleasure of mine. For over 25 years we have been working to conserve this podocarp forest & the absolute pleasure of waking up to that dawn chorus as the sun pierces the hill of trees, shows its working! Much of the breakfast we leave for you to eat at your leisure is produced from our own home-grown spray free produce or our own chooks. We have dogs, sheep and chickens on the property. Private walks - the 1.5 HOUR Puketawa Track or 40 minutes Slip Tack start from your lodge. Solid wood burning stove plus an electric oil filled heater is available. All bedding, towels & kitchen tea towels are provided at no extra charge. Available for use ate the house 50m from the lodge. A small fee is charged. Available at the house 50 m away from the lodge. Enough gigs for emailing & general Google searcges but not enough to do live streaming or downloading movies. Sorry! A peaceful and very comfortable retreat overlooking bush with birdsong around. Michélé is a very welcoming host with great attention to detail - so many little touches of baking and provisions. There is everything you need for a self-contained stay. Bush tracks on the property offer walks to mountain views or peaceful picnic spot. Such a great spot to just relax, sit in the sun (in December) and enjoy! Thank you Michélé! Our visit was short but this was my faborite place out of about 8 different places we stayed throughout New Zealand. The rental is immaculate, beautiful and no detail or personal touch is forgotten! Amazing and pretty perfect! The property around the rental is beautiful as well. I was also impressed with the story of 3 women who built the "tracks", kudos to you all!! I love Berrys Bush Lodge. One of the best places I have ever stayed, you won't be disappointed! A lovely oasis a short drive from Ohakune. A lovely oasis a short drive from Ohakune. We wanted to escape the hustle and bustle so being slightly removed from the town was perfect. Beautifully peaceful location and only ten minutes from the mountain. Beautifully peaceful location and only ten minutes from the mountain. The Bach is charming, its not huge but it is clean, warm & cosy. Its easily my favourite place I have stayed around the mountain. The wood burner is awesome and the kitchen is compact but, fully equiped. Michele was wonderful, as was her baking. The breakfast is out of this world, fresh bread, jams, yogurt, orange juice cereal; and thats not even mentioning all the different homemade cookies! Lodge was lovely, so quiet, great view and lots of great homemade produce for breakfast. Lodge was lovely, so quiet, great view and lots of great homemade produce for breakfast. Not to far from ohakune and the slopes, we will be back to try out the walks.